Ring green candles with honeysuckle flowers to attract money, or place them in a vase in the house for the same purpose. 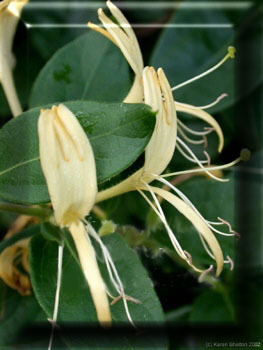 If a honeysuckle plant grows outside near your home it will bring good luck, and if it grows over the door it will keep fevers at bay for the household. Our Honeysuckle is sweet, makes you think of the South in the summertime!